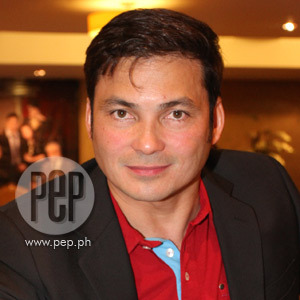 Gabby Concepcion: \"I\'m mad at the person who hurt the feelings of my daughter.\"
Gabby Concepcion: "I'm mad at the person who hurt the feelings of my daughter." Gabby Concepcion expects Piolo Pascual to approach him or Sharon Cuneta, following the breakup between KC and Piolo: "Whatever mistakes were done to my children, it is proper for anyone to approach the father, the mother, or anybody he has hurt." Gabby Concepcion was immediately surrounded by the showbiz media last night, December 6, when he attended the press conference of Yesterday Today Tomorrow, one of the entries competing in the 37th Metro Manila Film Festival on December 25. PEP.ph, the Philippine Entertainment Portal, was there. He reveals that he has not yet spoken to his eldest daughter, KC Concepcion, personally, but says they text each other often. As a father, how does Gabby feel about the breakup of his daughter and TV host-actor Piolo Pascual? Gabby answers: "Kalimutan na natin na nasa showbiz ang nakarelasyon ng aking anak, pero as a father, of course, I'm hurting. "Only because ngayon lang ako naka-experience na, mula noong umuwi ako, nagkaroon ng relasyon ang anak ko." Gabby stayed in the United States of America for 13 years, before he returned in March 2008. KC's father replied: "I'm mad at the person who hurt the feelings of my daughter. "I think it's normal. Nagkataon lang na nasa showbiz ang karelasyon niya. "Nakita ko sa TV how she was hurt. "I taught my daughter how to swim, how to ride a bike, how to do all that, and para paiyakin lang nang ganun ng isang tao...masakit." In her most recent interview, KC revealed that Piolo courted her for two years before they officially became a couple on October 21, 2010. In the past weeks, there had only been speculations about their relationship being on the rocks, until KC herself admitted last November 27, 2011 that they were no longer a couple. Gabby says about his daughter: "KC knew what she was getting into...but it all boils down to the intention." "Tingin ko lang, ang mga taong manliligaw sa anak ko, sa umpisa pa lang, dapat tunay na. "Saka ako, it really boils down to intention. "I would have done the same thing.'" Gabby says he expects Piolo to go to him or Sharon to clear things up. "Basta ama ako ng anak ko. "Whatever mistakes were done to my children, it is proper for anyone to approach the father, the mother, or anybody he has hurt. "He needs to do what he needs to do." ON YESTERDAY, TODAY AND TOMORROW. For the MMFF entry Yesterday Today Tomorrow, Gabby is paired with Maricel Soriano. The actress, who is known in local showbiz as the Diamond Star, is cast as the ex-wife of Gabby in this family drama. Since the breakup, Gabby's character has been attracted to Carla Abellana, who eventually becomes his new girlfriend. "Masayang kasama si Marya [Maricel's nickname]. I'm glad she's back," says Gabby about working with the Diamond Star. "Maraming gustong makakita kay Marya, my idol. "Ang naalaala ko talaga pag nakikita si Marya, ang John en Marsha." Does he and Marya reminisce about their past while on the set? "Napag-uusapan namin si William [Martinez, Maricel's former screen partner]. "By the way, William is a good friend of mine and lahat ng producers na gustong tumulong kay William, please help him out. "I'm here to back him up and I'm willing to do a movie or teleserye with him. "I hope to see him again in movies or TV. "Madalas kaming mag-usap ni William. "In fact, gusto ko siyang puntahan after ng interview na ito." How is it working with Carla? "I'm very excited na makasama si Carla," says Gabby. "I was there nung pinanganak ang sister ni Carla [Ericka]. "Nung nasa ospital si Sharon, nagkita kami ni PJ [Abellana, Carla's dad] along the hallway at nanganganak noon si Sharon kay KC. "Sabi ni PJ, 'Pare, manganganak na rin ang asawa ko. "Ngayon makakasama ko na si Carla [sa pelikula]. "Linya rin siya ng mga artista—si Delia Razon, si PJ, now si Carla." The former matinee idol feels blessed to be be part of YTT, his third movie since he made his showbiz comeback three years ago. "This is a movie that I really wanted to do. "It ends my years in a good way. "I thought 2011 would end na wala akong gagawin na project," Gabby says with a smile.